Singapore – A video posted in Singapore Peasant’s Facebook page on January 31, 2019 (Thursday) went viral and has garnered more than 3,000 likes and the same number of shares. 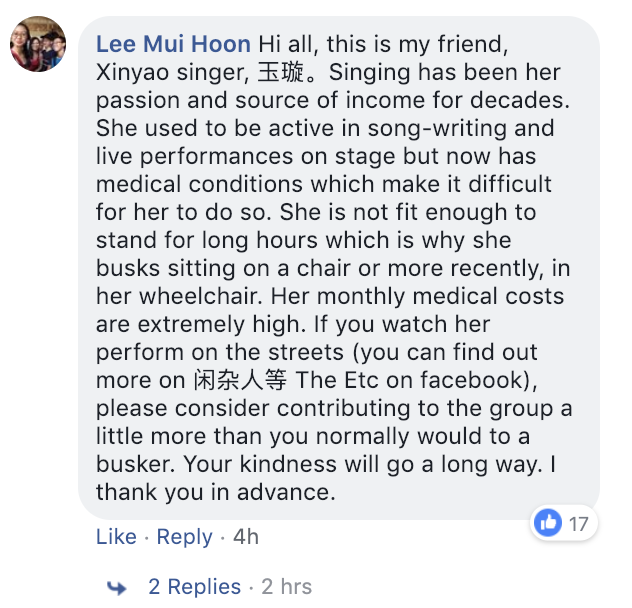 It was a performance of busker in Chinatown and has, since then, amazed not just her audience as she was singing live but the online community as well. 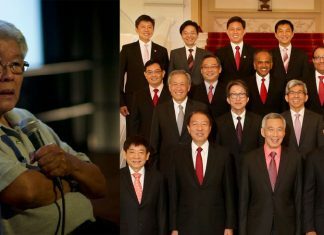 The video showed a crowd surrounding a street performer outside Chinatown MRT Exit A as she sang a rendition of the Cantonese song, Boundless Oceans, Vast Skies by Hongkong rock band Beyond. The audience gave their loud applause twice during the performance while others went up to the duo to give their tips. Thanks to a comment made by Lee Mui Hoon, a friend of the singer, the source of the beautiful voice was identified. The busker is Tang Yu Xuan, a 48-year-old singer who sang the popular xinyao song Xi Shui Chang Liu (细水长流). Xinyao is a genre that consists of modern Mandarin vocals established in Singapore in the 1980s. Another commenter posted the link of Ms. Tang performing with Joi Chua and Cai Lilian in 1998. Aside from singing, Ms. Tang has also written songs for numerous singers such as Valen Hsu Ru Yun, Andy Lau, and as mentioned above, Joi Chua. She has also worked as a backup singer for Kit Chan, Stephanie Sun and Andy Lau. Her first gig was at the Ark Music Café back in 1993. From there she met her two group members, Tristan Ong who was accompanying her on the keyboard in the video, and Joey Wee. They worked at experimenting with music and it was Mr. Ong who had the idea of busking. Thus, the band The ETC (闲杂人等) was formed in 2016. The ETC normally covers Mandarin, Cantonese and English classics and pop songs. They provide unplugged performances, wedding singing, and vocal lessons and workshops. The group started out by performing in town but soon realised that their genre and style had a greater appeal to those in the heartlands, hence their Chinatown, Kovan and Ang Mo Kio venues, to name a few.